If you knock her door, she still hears it. 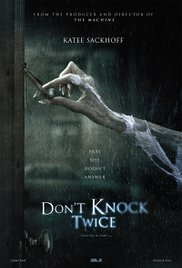 The movie “Don’t knock twice” should be a must watch for the mischiefs who like to play “Ding Dong Ditch”. Maybe this frightening legend will make them think twice the next time before they do that again. Nowadays, a horror film has to be fairly original to get noticed, because you can’t keep up with the number of releases. The “Ding Dong Ditch” trick is an interesting approach. And at the same time there’s the dramatic part about the shaky relationship between a mother and daughter. Apparently, the haunting witch doesn’t only scares those brats but she’s also good in patching up a bad mother-daughter relationship. Youngsters and legends. Always trouble. All hell breaks loose after Chloe (Lucy Boynton) receives a visit from her mother Jess (Katee Sackhoff) in the orphanage, where she was placed years ago. And this because of her mother’s persistent addiction which made her unable to care for her daughter. It’s not surprising that this confrontation goes terribly wrong, after which her daughter takes off with her boyfriend. They end up at the house of Mary Aminov, an old woman who commited suicide because she was fed up with the banging on her front door. And she planned to visit those who torment her again in the future, as an evil spirit. And what a surprise. The two carefree teenagers, who know the legend but don’t really believe in it, knock on the door. And before you know it, you’ll jump up when that ugly witch sneaks out of some dark corner, after which Chloe’s friend suddenly disappears. That would seem an appropriate time for Chloe to knock on her mother’s door (with no consequences). And this is the beginning of a joint venture to find a solution to get rid of the curse that rests on Chloe. Even though this movie contains a bunch of horror clichés that have been used in several films already, I thought it was scary and creepy enough. There are parts that remind you of the innumerable films about a possessed house with creepy sounds, threatening shadows and dark corners. There’s the diabolical spirit that controls the lights in a corridor (the same way as in “Lights out“), makes blood appear in cups of soup and creates hallucinations. And the creature that came out of the shadows immediately reminded me of the nasty demon in “Mama“. No wonder, because it was the same person, Javier Botet, who gave shape to this lugubrious, frightening creature. Some may think that the two completely different storylines used in this film, don’t really fit together. Personally, I thought it was a successful experiment. Bringing in an unsolved murder case, felt a bit too forced. And if that’s not enough, you’ll be surprised in the end. “Don’t knock twice” effortlessly exceeds the average. It’s scarier and creepier than you would think. And the protagonists played in an excellent way. Maybe the emotional part was a bit exaggerated. But the fear they showed at certain moments, just seemed real. For Katee Sackhoff no problem, because she already had to go up against a supernatural phenomena in “Oculus“. And the unknown Lucy Boynton (whom I didn’t recognize from “Murder on the Orient Express“) produced quite some decibels while screaming. Well, this movie won’t win a prize for originality. But are planning a horror movie night? This’ll fit perfectly.